I was all set to write about something obviously really important but then Twitter derailed my entire day as I shockingly discovered that two people who I love to bits and pieces have never seen The Princess Bride. It all started innocently enough—with me explaining how Mandy Patinkin and I could easily be best friends. I mean, you can totally see it, right? Dude sings in Yiddish—my Bubbie would be so proud. And then the truth came out—Who is Mandy Patinkin? Who is Inigo Montoya? Who’s preparing to die? WHAT? My pop culture brain is not cut out for this kind of information before 10am. But, well, in the interest of being honest, I guess now is as good a time as any to let you know that, well, I absolutely loathed the Lord of the Rings Trilogy. Honestly, it took me over three years to get through it. So, wanna guess how excited I am to see The Hobbit? EXACTLY ZERO PERCENT. I will probably take my kids to see it, since they are super pumped about it, but I will look at it as merely an opportunity to have a much-needed nap (Hello, I’m Ali and I’m geriatric) and to have myself a popcorn dinner. I didn’t see Braveheart until, um, 2010. I didn’t watch a single episode of Buffy the Vampire Slayer until 2011. I didn’t watch The Walking Dead or any of the Alien movies until 2012. See? Everyone’s got pop culture blind spots. Even ME. I have never seen the A-Team. I have never seen Curb Your Enthusiasm. I have never seen Blazing Saddles. I have never seen Singing in the Rain. I have never seen Citizen Kane. I have never seen On Golden Pond. I have never seen The Graduate. I have never seen The Soup or Tosh.0. I have never seen Happy Endings. I have never seen MASH. I have never seen Veronica Mars. I have never seen The X-Files. I have never seen American Horror Story. I have never seen America’s Got Talent. I have never seen The Rocky Horror Picture Show. I have never seen CSI: any city. Or any other similar acronym shows. What about YOU? What have you not seen? « It’s So Much Fun-akkah to Celebrate Hanukkah. I Mean, Adam Sandler Says So. See? I get the Monty Python references too. But I know who Mandy is because suddenly Homeland is my most favourite show EVER! Know who shocks me? My sister. My own BLOOD has not seen: National Lampoon’s Christmas Vacation, Scarface, Godfather I, II, or III, Goodfellas, or Casino. I almost want to not tell people we’re sister anymore! Also, Curb Your Enthusiasm is AMAZINGLY funny. We’d be twins if you weren’t 1/2 my size and if you watched The Soup and Tosh.0. I *would* watch them…I just haven’t. I don’t think I get the channel that they are on. YOU’VE NEVER SEEN ROCKY HORROR PICTURE SHOW???? You’ve never thrown toast at a movie screen or tossed rice in the air? I can’t believe this. I actually know all of the songs…but I have never seen the movie. Or the live show. I KNOW!! I’ve seen Citizen Kane and Singing in the Rain, but only because I took a film class in college. I also hated the Lord of the Rings trilogy, and only THIS YEAR did I watch any of the Star Wars movies. I’ve never seen Cool Hand Luke… I NEED to ask you this: Have you seen & read Valley of the Dolls? If not, you need to do this today, before you do anything else. From what I understand about Bond films, they are supposed to be cheesy, that is the appeal. 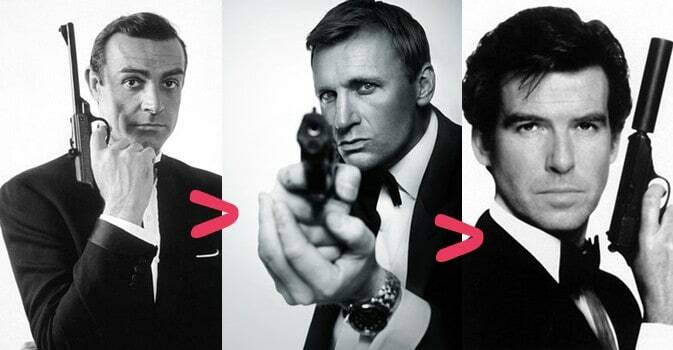 I quite like Pierce as Bond… ALSO: Curb your Enthusiasm? Hello Ali? Seinfeld!!!!! I own the first three seasons, come on over. I have not seen or read Valley of the Dolls! Homeland (not for lack of trying, but DirectTV is trying to kill me right now.) Breaking Dead. Twilight. The Office. LOST. Glee. Probably any movie that people have seen in the last five years and loved. I do know who Mandy is though, because he was on the first few seasons of Criminal Minds and I was sad when he left. Some of those are really worth watching. REALLY. I agree about the Lord of the Rings. My husband and I were talking about movies coming out soon that we need to see, and he mentioned The Hobbit. I suggested he plan a night out with his friends for that one. I already squandered 10 hours of my life watching the trilogy and I’m done. I’ve never seen: Ghost, The Sound of Music, Die Hard, or any reality/contest type shows. That’s the thing…the trilogy was sooooo long and drawn out. and now they are making three entire movies from one small Hobbit book? NO THANKS! I’ve never seen Godfather. I’ve never seen Gone with the Wind. I’ve never even had a DESIRE to watch any of the Lord of the Rings movies. I’m just watching West Wing NOW. You really should see The Godfather. and the second one. They truly are epic. and I know you’d like them. Ali. Happy endings and It’s a Wonderful Life. Watch. Please. Seriously. I know, I know, I KNOW. trust me. I only recently started watching Buffy and I’m still only on season 4…not loving it. I’ve seen at least part of every movie on your list and, trust me, some are not worth the fret. I’ve never seen The Big Lebowski or ANY of the Lord of the Rings movies. My kids laugh at me for my lameness. Love Lebowski. I quote it on a semi-regular basis. I have never seen the movies ET or Titanic. When ET came out it was one of the first movies I remember that had tie-in marketing from fast food and every other avenue. It was so pervasive that I was sick of the marketing before I ever realised the movie was out. But now that I have kids I may be forced to watch it. shut.the.front.door. Here I’ve been all thinking we are long lost best friends that live thousands of miles away from each other and in a totally non-awkward way only one of us knows about the friendship… I am heartbroken. Please watch It’s A Wonderful Life and Singin’ In the Rain, so our friendship can be restored. Then move to Oklahoma. Oh, I know I will love both of them…I have just never seen them. I promise it’ll happen asap! No Grey’s Anatomy, Desperate Housewives, or Lost for me. No interest in The Hobbit. None. I cannot believe someone missed ET. WHAT?? I only watched the first season of DH..it was all I could handle! I OWN Blazing Saddles and I’ve still never seen it. Same with The Blues Brothers. Also, let’s not talk about my list ok? It’s embarrassing. I have never seen any of the Godfather movies. I have never seen Grey’s Anatomy. Or Dexter. Or Rescue Me. Or Glee. I have never watched an episode of Friends. Or Glee. Or any of the awsesome HBO or other cable shows that are out now. I do however, enjoy some acronum shows. I resisted It’s A Wonderful Life for many years. But finally gave in and watched. It’s really good. We watch it every year.